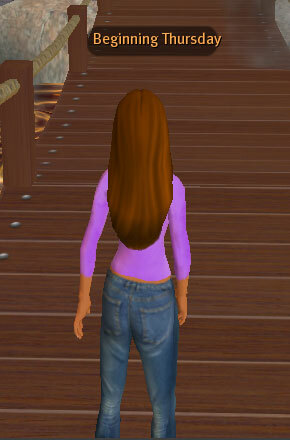 Your first fumbling steps in Second Life will almost inevitably be with an exquisite view of the back of your avatar's head. But what if you want to see yourself from the front? Since Second Life is designed as a visual environment, it really does help to be able to see things. Thus, your experience can be enhanced greatly by mastering the wonders of the camera controls. "Camera", in this case, refers to the "point of view" that you view the world from on your screen. The camera will follow whatever you have selected as its point of focus. By default, the point of focus is your avatar, so that wherever your avatar goes, the camera shall follow. The camera can be moved around this point of focus through a couple of different means. At the bottom of your screen, you should see a button labeled 'View'. Pressing this reveals a series of options. 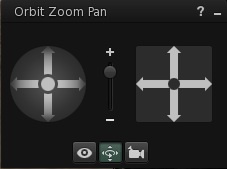 The button with the little arrow circling around is the Orbit Zoom Pan view. The set of arrows on the left (in the circle) is the orbit controls. The left and right arrows will move the camera around your point of focus and the up and down arrows will tilt the camera up over or down below it. The plus/minus slider in the middle will zoom the camera in and out. The arrows on the right (in the square) control the Pan view. This will send the camera up, down, left or right, depending on which arrow you press. The little eyeball brings up a series of preset camera positions. These have been helpfully labeled Front View, Side View and Rear View. However, these camera positions are actually relative to where the point of focus was last. 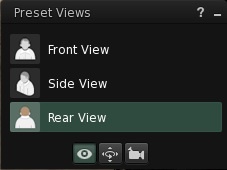 If you've been messing about with the camera controls and then switch to these presets, you may find that Front View will end up being Rear View or Side View, depending on where the camera was pointing at the time. If this happens (indeed any time your camera winds up in a confusing place) simply press the Escape key, which should bring the point of focus back to just behind your avatar. 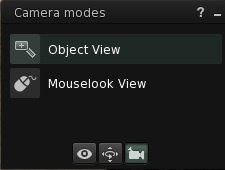 The little camera brings up the two Camera Modes. Mouselook makes the point of focus visible as a tiny square with a sort of crosshair space in the center. Move your mouse to move the crosshair and the camera will follow. Even though you can't see your avatar, you can still move, though the left and right keys will move your avatar from side to side rather than turning. Mouselook is principally used for shooting games, as the crosshairs signal to scripted objects where one's 'aim' is. You'll notice Mouselook also has the helpful reminder to "Press ESC to return to World View" at the bottom of the screen, as it can be triggered accidentally (by hitting the letter "M" when chat isn't active) and can be awfully disorienting if unexpected. PS--those of you with rotating wheelie things on your mouses will find that the wheelie will also serve to zoom in and out. I can't tell you much about that, 'cos I'm a MacBook person, but there you are. So, now you can see your avatar from all possible angles. Pretty neat, huh? But what if you want to focus your camera on something else? The point of focus can be changed at any time (or even back to yourself) by Alt-clicking on whatever you want to look at. So if you want to look at a sign, you can Alt-click on the sign and angle the camera so you can see it clearly. If you want to observe a statue, you can Alt-click on the statue and look all around it. You can even Alt-click on other avatars in your view, though this can be very disorienting if they get up and walk somewhere else, as the camera will follow right after them. Once again, if your camera gets dragged somewhere and you need to retrieve it, hitting Escape will bring the point of focus back to you. If you want even finer focus of your camera, you can combine the key combinations mentioned above with clicking and dragging. Alt-dragging will move the camera around as you move left and right, and zoom the camera in and out as you move it up and down. Control-Alt-dragging will also move the camera around at left and right, and tilt the camera up and down as you move the mouse up and down. Shift-Control-Alt dragging will track the camera in whatever direction you move the mouse. Now go and see what there is to see!